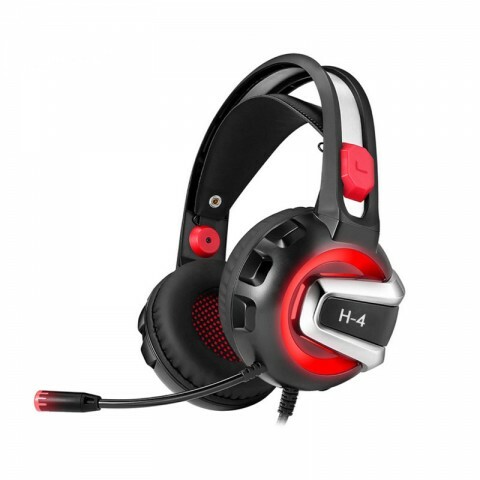 ET H-4 Gaming Headset, which comes with unique lightweigh, environmental material，self-adjusting head and ect to bring perfect playing experience, support Win7/Win8/Win8.1/Win10/XP system in 32-bit or 64-bit. ET H-4 Gaming Headset is not the well-known headset brand, but, with its H-4 offering the quality sound that will satisfy almost all users. 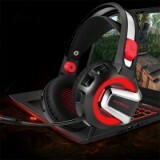 It allows for watching movies and listening to music as long as you aren't too picky about the sound. • Applicable to the audio device which has 3.5mm single-plug interface. • Skin-friendly protein earmuff, which features environmental protection, wear-proof and wearing comfortable. • Unique lightweight designed, self-adjusting head beam for great wearing experience. • High-quality speaker unit delivers noise-canceling and bass sound experience. • High-sensitivity and flexible microphone offers more accurate, clear and smooth voice. • Support Win7/Win8/Win8.1/Win10/XP system in 32-bit or 64-bit. • 1. There is accompaniment but no singing when playing music? The plug of H-4 headset is international (CTIA) standard single 3.5mm quadrupolar type, that pin connection is left channel, right channel, ground wire, and microphone. It is the most popular connection in the market. 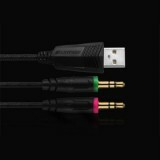 If your device is a non-international standard interface, there will arise the phenomenon of background sound only, you need to use an adapter cable for it. B) Please make sure that if your device has a non-international standard interface which has the function of audio/voice combination. • 3. There arises the noise, small volume, unclear sound, or one side with sound and the other side without sound? B) Please make sure your device has the international standard interface which is quadrupolar and single plug type. • 4. 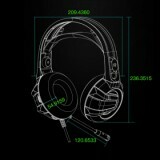 No sound when using the headset? C) Please check if the microphone boost of your computer is turned on. Please open the Control Panel -> Sound -> Record -> Level -> Microphone Boost to adjust the mode. • Please enjoy music at a moderate volume to prevent adverse effects on the hearing. • Please be careful to wear when driving or cycling. Headset comfort is of utmost importance during extended gaming sessions. The Kama keeps your ears comfortable with its padded, adjustable headrail, which extends an extra 1.25 inches on either side to accommodate a wide range of head sizes.. Very comfortable, great quality. I bought these for my daughter to use with her laptop, they're comfortable to wear and they work great. The LED only works when plugged in to USB so the only complaint is that it takes up a USB slot, but that's very minor, I highly recommend these. I ordered this headset because I was looking for one for my nine-years old and knowing that he does not take good care of his things, I did not want to spend too much thinking that he was going to ruin it anyway in a few months. Well, he has loved it so far and you can't beat the price. The product arrived on time and without any issues. Got these for my dad to use for online work conferences, and he loved them so much that I got myself a pair to use for my online university tutorials. My only minor complaint is that the USB cord to activate the lights is pretty short. Amazing sound, and I mean amazing. I have had several headsets in the past and this one is on of my favorites. They have amazing base, like fall off your head base...it is amazing. I also love the black color it is a matte black and is amazing looking. They are also very light weight and feel amazing. Love them.